Snap fasteners have come to form an integral part of clothing design, and consumers want good, user-friendly fasteners because they use these items every day and over extended periods of time. However, this is actually quite difficult. If a snap fastener is too stiff, it will be tough to snap together. In contrast, if a snap fastener is too soft, it can come loose while wearing. This is why adjustments need to be made on the micro level in order to ensure a snap fastener works flawlessly. Hisanaga Seisakusho designs its snap fasteners based on its long-standing experience and technologies that provide usability, comfort, and visual appeal. We continually aspire to create products that are easy to use, safe and comfortable. 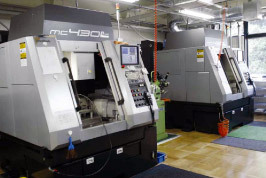 Our manufacturing line features the latest equipment and our integrated quality control system spans every process, from mold design and trial production to the precision press plastic machining line, plating machining, inspections and shipment. We produce some 500 million snap fasteners each month that offer consistent, globally trusted quality.